Even though the Alabama Crimson Tide didn’t win the national championship, the team still had an outstanding season. It also has a very bright future ahead of it. Please note that I’m not suggesting that this loss won’t sting throughout the offseason. It certainly will. The Tide took a 14-point lead in the second quarter, and had a 10-point advantage heading into the fourth quarter. 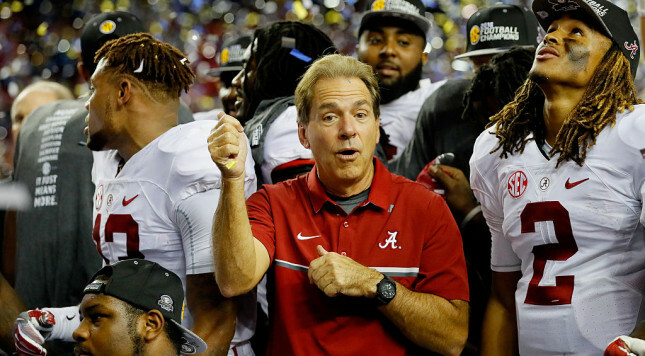 According to ESPN, Alabama was 97-0 under Nick Saban when leading by double digits heading into the final period. For a brief moment, it looked like the Tide would extend that record to 98-0. After Clemson pulled ahead 28-24 in the fourth quarter, Jalen Hurts led the team on a 6-play, 68-yard scoring drive to retake the lead with just over two minutes remaining. However, the Tigers won the game – and the national championship – on the final series thanks to the precision passing of Deshaun Watson. Although the ending was certainly a disappointment, it’s tough to argue that the 2016-17 campaign was anything other than a success. Despite having to break in some new starters on offense this year, Alabama was still one of the better units in the country, ranking 14th in scoring and 11th in rushing. And while the passing game didn’t routinely throw for 300 yards, Hurts was one of the more accurate passers in the country this season, completing 64.7% of his throws (heading into Monday night’s action). On the other side of the ball, Alabama’s defense was clearly the best in the country this year. It led the nation in scoring defense, total defense, run defense, and yards per play. In addition, the Tide D ranked in the top 10 in turnovers forced, interceptions, sacks, tackles for a loss, and third down conversion percentage. It’s tough to argue with those results, which is why Alabama will be in the mix for the national championship again in 2017. Sure, they’ll have to replace a few key players next season. But, with Jalen Hurts, Bo Scarbrough, and several starters from the nation’s best defense returning, there’s no reason to think that the Tide won’t be in the College Football Playoff next year.